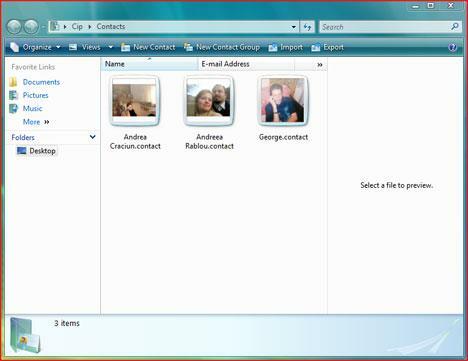 Windows Contacts is a new application distributed with Windows Vista, that replaces the old Windows Address Book. This application has all the features of its predecessor and some new ones such as the ability to add pictures to your contacts, a new XML based file format for storing contacts and better extensibility for integration with other applications. As you can imagine, Windows Contacts integrates with Windows Mail. When you create an e‑mail message in Windows Mail, you select the recipient from your Contacts folder. 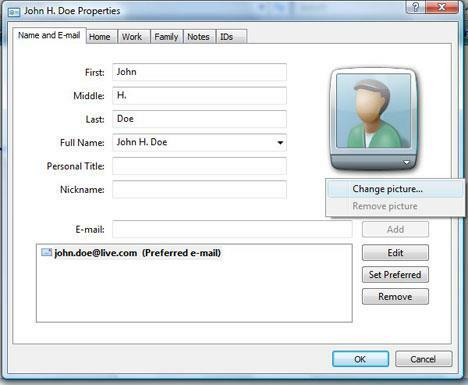 Even if you do not use Windows Mail as your default e‑mail client, you can still use Windows Contacts to store all the contact information about the people you know. The Windows Contacts shortcut can be found directly in Start Menu -> All Programs. When the application is launched, it loads all the existing contacts. Windows Contacts offers a pretty limited functionality. All you can do is create or delete contacts, create contact groups and import or export your contact list. To create a new contact, press the New Contact button. A new window will appear where you will be able to enter the information you have about your new contact. You can enter plenty of information which is split into several categories: name and e-mail, home, work, family, notes and IDs. You can also add a picture of your contact. To do that, click on the small arrow that can be found below the picture icon from the right side of the window. A small menu containing two options will appear. From this menu, select the Change picture option and then browse to the location of the contact's picture. After you have finished completing all the information press the OK button and the new contact will be added to your contact list. NOTE: If you cannot find the New Contact button, then right click and select New -> Contact. Missing buttons from the Windows Contacts toolbar? I was wondering if it was possible to some how populate Windows Calendar with the birthday and anniversary information that is contained in Windows Contacts? If not, is this something that is on the horizon? And if not, in the interim, what would be a good add-on calendar program that could seamlessly handle this requirement? Thanks. Yes, I would like to see this capability as well, importing dates from the contacts into Windows Vista Calendar. I created a large email group of 0v 2000 contacts in one group to find out that it is to large to send, how do I move the contacts from this group to open new groups of 100 contacts each that I could email. how do you set defaults fo rwindows contacts in Vista? i want all names stored as lastname,firstname. When you're in the contacts window, right-click on the bar over the contacts, the one that has 'Name, E-Mail Address, Business Phone...' on it. You'll see a list appear with check boxes next to it, that list is showing what fields are displayed on your list. Check the 'Last Name' option and you'll see that field appear on the bar. (If you don't see it, stretch the window out wider until you do.) Click on the Last Name field to re-sort your contacts by their last names. If you want to see a list with Last Name, First Name, repeat the above process and add the First Name field. Change the views option to Details, then click and drag Last Name and First Name to the left side of the bar. How do you 'change the views option to Detail and then click and drag last name and first name to the left side of the bar'? Thanks. This does seem to control sorting in the Contacts window, but unfortunately it does not affect sorting in the "Select Recipients" window of Windows Mail. That is what I am looking for (like in OE), and I assume that is what most people want. Any ideas? In Windows Contacts under the Tab Name and E-mail there is a box that fills up automatically as you enter First (name), Last (name), etc. Click on the drop-down arrow associated with that box. You will then be able to select lastname, firstname for that Contact. Is there a way to do this automatically for all contacts? A year past since this question was posted. It looks like there is no answer to it. I wouldn't buy Vista if I didn't need a new PC. Before, in Win XP using Outlook Express I was able to add my contact list to the front of Outlook interface, at the bottom left lower part of it for easy access, I can't do that now, any suggestions on how to do it in Vista Mail? I am unable to add new contacts, or edit a contact, in Microsoft Mail/Contacts (Vista). I can create new messages in Mail, but when I press the TO button I get a message "Unable to choose recipients". I can't edit a contact, either. When you press NEW CONTACT, I get a flashing window only. I screwed it up, somehow, trying to get Outlook 2000 to work (which I have now abandoned). This message is concerning Mail/Contacts, NOT Outlook 2000. Any idea how I can refresh my system with Mail AND Contacts?? how do I get the import/export button back on the windows contacts in vista? Whenever I receive an e-mail, that person's name and e-mail address is automatically recorded in my Windows Contacts. I do not want it to do this. How is this function turned off? Thanks. Probably only adds contacts when you reply. Go to Tools on Windows Mail, Options, Read. It's not just when you reply; it automatically adds everyone to your contact list. So if someone sends you and 50 other people you don't know an email, all those people get added to your list. I hate it, and the reason I'm on here is to find out how to change it. The tools menu doesn't give you the option. Does anyone know how to use a contact group in WM without all of the addresses appearing in the message. I have tried addressing to myself with the "Group" in the copy box but the addresses still seem to appear ? Can anyone help me. I'm trying to import / create new contacts in Windows Contacts, but there appears to be a software error. When I click 'new contact' a box pops up for less than half a second and then disappears. Whe I click 'import' I get a sngle dialogue box containing nothjing more than a red circle with a cross through it entitled 'error'! I did install MS Office XP 2002 before finding out that Vista and Office 2002 don't get on. I've since uninstalled it but wonder if that's got anything to do with it. I am, though, aware that othes have had similar problems. I have recently acquired a new computer with Vista. Have imported my old email address (from XP) and now I cannot open my group contacts to either view or add and delete names. i just deleted my entire vista windows contacts on accident (i was trying to delete a shortcut icon) does anyone know how i can get this feature back? Have you looked in the Re-cycle bin? In Outlook Express I could organize my contacts in folders such as "gov. ", "community club", "high school class mates", etc. Then when I prepared a message, I selected the folder that contained the person I wished to send to and selected the person. In Windows Mail, I have not been able to do that. Even if I organize in folders like I did in OE, the addresses come up in one long integrated list. How do I get back to the OE organization? I have this same problem. Even though the contacts appear in folders in the contacts list, they do not appear in folders when you're composing a message and click on the "To" icon. What appears is, as you say, one long list. Have you found the answer to this problem yet? If you have, I hope you'll share it with me. OE permitted subfolders (family, friends, work, neighbors, etc). In a new message, the identities are easily found using TO--changing the mail identity's contacts to a subfolder (family). How can subfolder contents be found in WM? I have added the home address to my details view, but the home addresses are not appearing. I've tried enlarging the field and the addresses still do not show. Any suggestions on what I am doing wrong??? Choose the details view. Place the cursor on a column heading and right click. A second window will open saying Choose Details. There are a great many details to choose from with some apparent duplucation. When it comes to street info for example: you can choose Home Street or Home Address. One of the two should work as you list address info, etc. in the details view. Windows Mail does not automatically complete e-mail address even though that feature is checked. How do I get the Contacts Folder to display when I open windows mail? Outlook Express use to have the Address Book on display in the left hand column, under the Main Folders. This enabled me to just double click on a name to begain composing an email with the email address automatically inserted. If possible can someone please help me to find a solution for a simple problem? I am facing windows vista operating system errors when i log in normally, but can enter via safe mode. All i wish to save is my 6000 contacts which are in many groups. I wish to backup contact including groups mailing list. Than i can run full recovery to reinstall vista back to factory settings. After this i would like to import all my contacts including Groups mailing list. I have tried vcf and comma export but it doesn't carrp groups mailing list. It shows blank once i click on the groups and some how all the contact members not selected. Can somone help me on this? Thanks in advance. I have added photos for my individual contacts, however within 24 hrs of adding them they dissappear from the photo box whilst still appearing as a photo against their name on the contacts home page. What am I doing wrong?? When I send an email, in the To: it will show the contact name followed by <> with contacts email address inside brackets. How can I get rid of the second part <> and just show the contact name? I've just emptied my deleted email folder to find that one of the emails in it was very important and I need it. Is there any way of retrieving them. I'm desperate. Windows will no let me send an email without first adding the address to my contacts? Is there a way to stop this? I am importing Contacts from a Palm and for the most part it's worked fine. Problem: certain fields don't import. Example: "Company Main Phone" and "Birthday." I decided to re-enter this information by hand but... found that I can get a "Company Main Phone" field to show up in the "Main Pane" but when I double-click to edit a contact, there is no place to enter this information. Do I have to edit the contact entry form? How do I do that? I'm using a French version of Vista, so I'm not entirely sure what some of the column headings are in English. But one field that appeared previously under the 'Professional' tab on a contact was 'Office Location'. In French, this has now become the 'Service' field - at least that's where all the entries I imported ended up. The problem is that whilst an individual entry display the contents of the "Service" (previously "Office Location") field, if one enables the column in the Contacts display and chooses the "Details" display, nothing appears in the "Service" column. One can still elect to sort using that field, but it isn't displayed. I always found it a very useful field as it could be used to group contacts easily and furthermore, if one wished to use the "Find Contacts" click under Outlook Express, it was also searched as part of the "Other" fields. This gave you the possibility to have the names of several different groups in the "Office Location" field. Even if one were using Outlook, it was superior to the "Category" field because it could be set in MS Excel if one wished to assign a category to many contacts at the same time. How do I display the "Service" field (previously "Office Location")? How do I stop all email addresses that are on the To: line from being saved into my Contacts list? Is there any way to consolidate contacts? Example, one contact appears three times. I want his second email address to show as "email2" but it doesn't seem to work..once done I can delete one copy. When I right click the contact foldr I do no get a "send to" option. I can't figure out how to send an e-mail to the entire group without selecting them individually. I do not have a New Contact button on my Windows Contacts. Help?? Wouldn't it be wonderful if we could transfer the old Cardfile files (I have several hundred - now totaly useless!!) to the new Windows Contact program? I can't create import or edit my contacts. I click on the creat contact andthe hourg glass shows for about a 1/4 second.Nothing happens. I can add a contact when I receive an e-mail but it only adds the email address I can't edit it. Any suggestions? I am unable to view my single Group or to add new/existing contacts to it. I was able to create the group and add contacts that existed at that time. When I compose or forward mail on Windows Mail and select one or more contacts for this email, their name and email address shows up. I do not want to share everyone's email address. How can I stop this from happening? I use my calendar daily. I am using Vista. It was set to come up automatically at start up. For some reason, it has stopped coming up. I can still get into it, but I want it to come up for a reminder. How can I start it up again? Both my wife and I use the same laptop and have separate user user accounts. Email received in Windows mail goes to separate accounts. However, the contact list is co-mingled. Is there a way to have separate contact lists for separate users within Windows mail? Creating a database with Windows Contacts & pop-up of birthdays. How can I create a set of contacts(contacts list) with Windows Contacts, that will pop up birthdays and notify me on my e-mail? What are the functions and limitations of the Windows Contacts compared to MS Access? Is there any chance I can add additional private numbers to my contacts ? I have friends that use different cell phones in different countries and would like to add them all in the "private" categorie. Is that possible at all ? Can a contact e-mail address be put into my contacts list without me doing it? hi, i have a rating column in my contact. where u can rate your contact from 1 to 5 stars. how do you given them the stars to rate them ??? i have tried everything, please help. thanks. Birthdays entered in contacts OK, but when I go to the list, all birthdays show as one day earlier. Example: Born on June 25 - will show as June 24 in list, Born Apr 1 - will show as March 31, etc. Am I the only one having this problem. It's driving me absolutely nuts. How can I delete contacts from my contacts list in windows 7? I have hundereds that I no longer use and do not want to keep. Hi, I once sync my iphone 3gs with my window vistal laptop. so it automatically sync all my iphone contacts into my laptop window contacts. but then i gave my phone another one and i also bought a new mac laptop. So i copied all the contacts on my laptop to an CD and then put that cd into my mac and copied all the cd contacts into mac. Now every time i try to open any of those contacts. it opens it up in firefox and i get this error message - This XML file does not appear to have any style information associated with it. The document tree is shown below. I also get bunch of html codes. so if anyone can help me out how to open these contacts in my mac book. I currently dont have the window vista laptop nor the iphone. The only thing i have is those contacts saved on my mac. Using Windows 10 Live mail I do not get all my contacts when entering a new email TO, or in the forward function. All my contacts are displayed from the contacts tile. I have 3 email accounts setup, Comcast, Gmail, Hotmail in my mail accounts.